Zoo Nights & Lights is a holiday tradition to behold. Everyone will enjoy live performances from local bands and choirs while taking in the dazzling light displays. Browse for holiday gifts at our arts and crafts show. And, kids can decorate a gingerbread cookie and make a craft. The Gladys Porter Zoo invites Rio Grande Valley residents and visitors to its annual holiday celebration on December 7th, 8th and 9th from 6 p.m. to 9 p.m. Tickets are now on sale for $2.50 or donate a new, unwrapped toy for Toys for Tots and get in free. Zoo members get in free with their membership cards. Tickets are available now for pre-sale online, Zoo office or can be purchased at the gate on each night of the event. Zoo Nights & Lights offers the holiday spirit for all families and a romantic setting for a date night. It is an event designed to give people a break from the stress of the holiday season. There is a lot to do in the Mitte Cultural District, so after you visit the Zoo make plans to walk over to the Dean Porter Park to see the free Holiday Village display. These quaint cottages, which are dressed up for the holidays, are truly a unique sight. Come out to enjoy live performances from local bands and choirs while taking in the ambiance. Ensamble La Misión will perform every evening during Zoo Nights & Lights. Music is a family matter for Ensamble La Misión. In this quintet, a mother and son harmonize on vocals and everyone, including father, mother and three sons, play an eclectic mix of ethnic instruments. They sing in English, Spanish, French and Portuguese. Ensamble La Misión has a wide musical repertoire, and their sound will create the holiday ambiance visitors will appreciate. Kids will have a great time at the events we have planned this year. All activities are included in the admission fee to Zoo Nights and Lights unless specified. How the Grinch Stole Christmas! By Dr. Seuss will be read every evening during Zoo Nights & Lights at Pizzooria. Everyone can shop at our arts and crafts show for holiday gifts. Also, it wouldn’t be Zoo Nights & Lights if there wasn’t going to be plenty of hot chocolate and churros! Check out our list of vendors below. A vendor list is being compiled keep checking our site. We will post the final list soon. Over the years, the Zoo maintenance staff has created a dazzling collection of approximately 150 lighted animal and holiday fixtures. 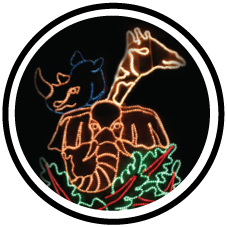 Don’t forget to keep an eye out for some of the Zoo’s most infamous lighted attractions, including the animated escaping gorillas as they appear to walk the roof tops and the chimpanzees climbing the palm trees. Staff also places 800 luminaria bags along the walkways. Also on display, we have a new lion themed tree in our Christmas tree forest. The tree features ornaments inspired by our majestic lion. We still have our zoo animal inspired trees on display. Each tree is adorned with some handcrafted ornaments inspired by peacocks, marine creatures, and reptiles.